I was standing next Jim Lacy and asked him about the song and he then regaled me with how great this guy Bruce Cockburn was and said I should hear the song that had just started getting some radio airplay in the Boston area, “If I Had a Rocket Launcher.” Within a week I had purchased his new album ‘Stealing Fire’ and was working on acquiring his previous albums as well; I was hooked. I had always preferred listening to intelligent and imaginative singer/songwriters the likes of Paul Simon & Shawn Phillips etc, and Bruce certainly fulfilled those qualities and to boot he was, as I found out after seeing him play live, a world class guitarist. Over the years, we have attended many of Bruce’s concerts, I’ve no idea how many but I would say 12-15; some with opening acts (Sam Phillips, Patty Larkin to name two), some accompanied by a full band, some just intimate Bruce only shows. 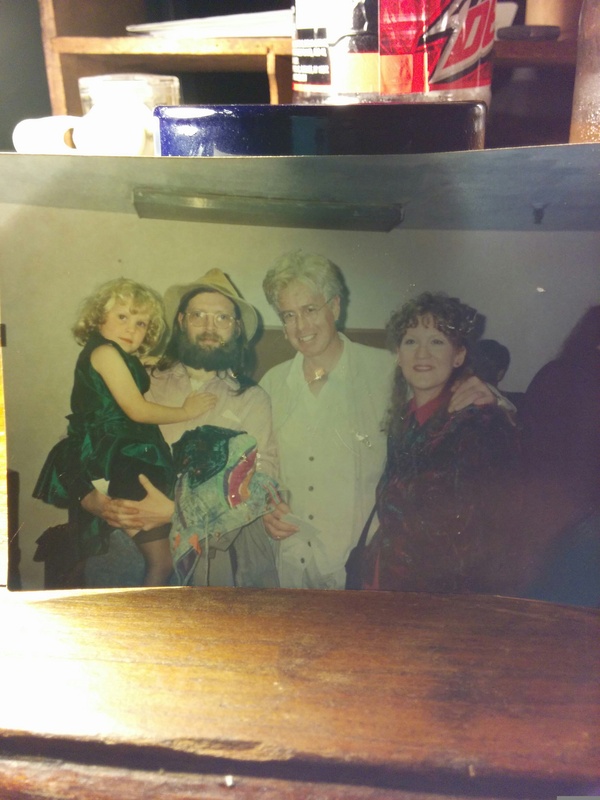 Even managed to go backstage with my wife, two 14 year old sons and 5 year old daughter and meet him in 1994. Even though for only a few short minutes I was struck at how gracious and engaging he was. He actually remembered me from a letter I had written him about a year prior. As to Bruce’s performance tonight, he pulled songs out of every era in his vast repertoire from early works like ‘God Bless the Children’ and ‘All the Diamonds’….to later songs like ‘The Iris of the World’ and ‘Bohemian 3 Step’. The staples were also played, ‘Lovers in a Dangerous Time’, ‘Rocket Launcher’, Wondering Where the Lions Are’. Of my many favorites, he included ‘Rumours of Glory’, ‘Hills of Morning’ and ‘Pacing the Cage’. His voice was strong, his fingers still displaying a mesmerizing nimbleness as he coaxed love out of his three acoustical guitars(I’m guessing that two of them were Manzers, not sure about the 12-string.) I find that no matter how far I am sitting from the stage that my focus is always drawn to his amazing guitar playing. 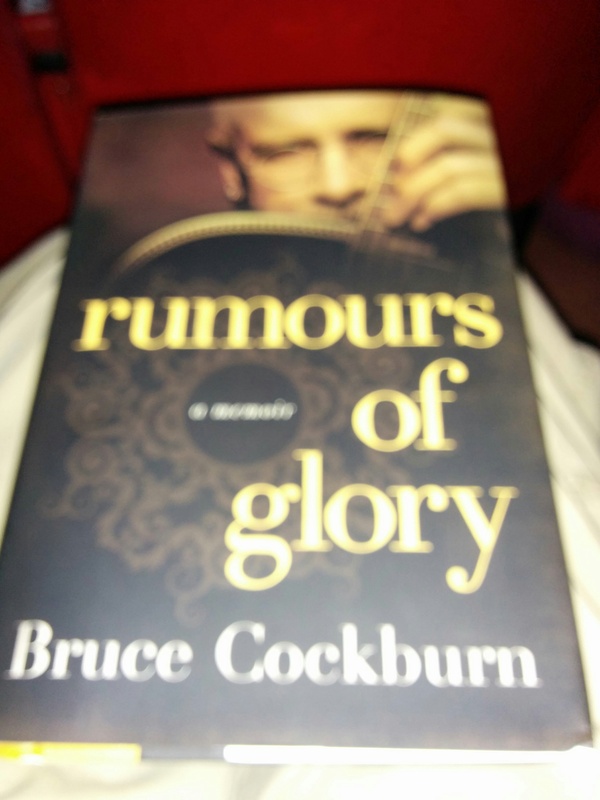 I mentioned earlier about waiting in line after the show to get a copy of Bruce’s recently released memoir, Rumours of Glory, signed. This was a birthday gift from my wife, indeed the tickets to the concert were also a birthday gift from my three children, two daughters-in-law and three grand children. 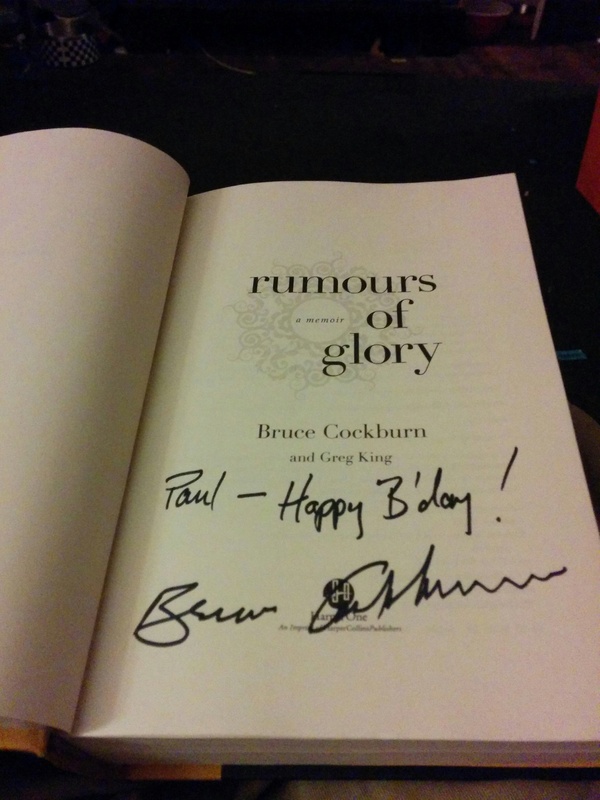 Bruce was most obliging to sign mine with a happy b’day to boot. I am glad I got to see him play again, it had been too many years in between and I certainly cherished the music as it washed over me like a soothing balm for the spirit. If you have not listened to him in a while, you should remedy that soon.